As the “100 Years Kea Shipwrecks Org.” shifts into gear, a sequence of Speaker confirmations trickles in from various places. Their common denominator: knowledge and passion about these great lost liners turning ‘100 years’ from their sinking’s in the crystal clear blue waters of the Aegean Sea and the Kea Channel. We will be adding Speaker names as their confirmations occur, in Alphabetical order. Once their presentation topic is chosen, such will also be added. Hence do visit often this page for updates. Bishop Leigh, from the UK, Leigh is a world-renowned shipwreck explorer and specialist deep-water photographer. He has been a member on many well-known shipwreck expeditions, including five expeditions to HMHS Britannic. He has worked on numerous television shipwreck documentaries and his still photography has been used in countless books and major worldwide newspapers. He has published extensively on the subject, lectures globally and was the co founder of the acclaimed Advanced Diving Conference, EUROTEK. He will represent DIVER magazine as a staff reporter and will also talk about how he has photographed Britannic over the years, the 98 & 2003 expeditions, as well as taking the opportunity to show some unseen photographs. Topic: “The History of Technical Diving on Britannic. A joint presentation with Richie Kohler. Richie will begin with the Cousteau expedition in 1976, while Leigh will then cover the 2003 expedition and lightly touch on the 1998 expedition; Richie will then come back in and take a little about 2006. Leigh will then talk about the 2009 expedition, about how the team was put it together and about the loss of his best friend Carl Spencer; Richie will pick on that with his talk about the boiler room explorations in 2009, and will then finish off with recent dives and the U-Boat Russian team”. Topic: “How the ‘Olympic’ class liners came into being. Mark will explore and summarize how the ‘Olympic’ class liners came into being, looking at the design, construction, financing and logistics of creating the three enormous ships. He will describe some of the changes made to ensure Britannic was more luxurious and comfortable than her sisters, as well as looking at many of the design changes made as a result of the Titanic disaster in 1912″. Topic: “The sad story of S/S BURDIGALA, former S/S KAISER FRIEDRICH (1897-1916)”. A brief reference concerning the transatlantic travels and the steam, the battle for marine sovereignty in the Νorth Atlantic, the rising of the German merchant marine, the construction of S/S KAISER FRIEDRICH and the NDL and HAPAG. Focusing on the failure of S/S KAISER FRIEDRICH to meet the term of the contract with NDL. Further: The Compagnie de Navigation Sud-Atlantique, the renaming to S/S BURDIGALA, the requisition of the vessel and the sinking due to a German mine laid by U 73. Closing by focusing on the problematic “mine or torpedo?”. Topic: “The History of Technical Diving on Britannic. A joint presentation with Leigh Bishop. Richie will begin with the Cousteau expedition in 1976, while Leigh will then cover the 2003 expedition and lightly touch on the 1998 expedition; Richie will then come back in and take a little about 2006. Leigh will then talk about the 2009 expedition, about how the team was put it together and about the loss of his best friend Carl Spencer; Richie will pick on that with his talk about the boiler room explorations in 2009, and will then finish off with recent dives and the U-Boat Russian team”. Michailakis Michail, from GR, more here: www.hmhsbritannic.weebly.com BRITANNIC Researcher, writer & creator of the “HOSPITAL SHIP BRITANNIC” website. Topic: “293 DAYS: THE WARTIME CAREER & THE SINKING OF HMHS BRITANNIC”. The deployment of the Britannic in the theater of operations of the Eastern Mediterranean during WW1 and the events that took place during and after her sinking in the Kea Channel”. Mills Simon, FRSA, from the UK, owner of the HMHS Britannic. By profession he is a filmmaker, historian and author. Simon’s company, Governcheck Limited, currently controls the UK Government’s legal title to the wreck of the HMHS Britannic, and they have now been coordinating the exploration and analysis of the wreck for over twenty years. More here: Q & A with Simon Mills. Topic: ­­­­­­­­­­­“The Odyssey of the S.S. Britannic. The presentation is aimed at describing how the historical research into the loss of the HMHS Britannic has been reconciled through the use of manned exploration of the wreck, combined with support from scientific, media and archaeological interests, with a view to a progressive, controlled and sustainable conservation project for the future”. Mitchell James Jonathan, from the UK, is a grandson of the late Sheila Macbeth-Mitchell, a volunteer nurse of the HMS Britannic, one of the survivors. She was 26 years old and one of 1.136 persons aboard the great ship when it was hit. Back in 1977, Captain Cousteau invited Mrs. Mitchell on board the Calypso and at that time aged 86, she was brave enough to go in the mini-sub for a remarkable dive around the shipwreck! Jonathan, an esteemed lawyer in Edinburgh [has a wide civil practice, predominantly in all areas of public law, complex family law issues, and commercial litigation; special interests include information law and international jurisdiction questions. In addition to his court appearances, he has an active opinion practice]. He will speak about his super grandmother on a number of aspects of her experience- either directly related to the voyage and sinking, or other aspects of her life (which aren’t as well-known). There will also be a display of a number of memorabilia from the Britannic plus her scrapbook! Topic: “My grandmother Sheila Macbeth led a long and full life after the sinking of the Britannic, dying in 1994 at the age of 103. 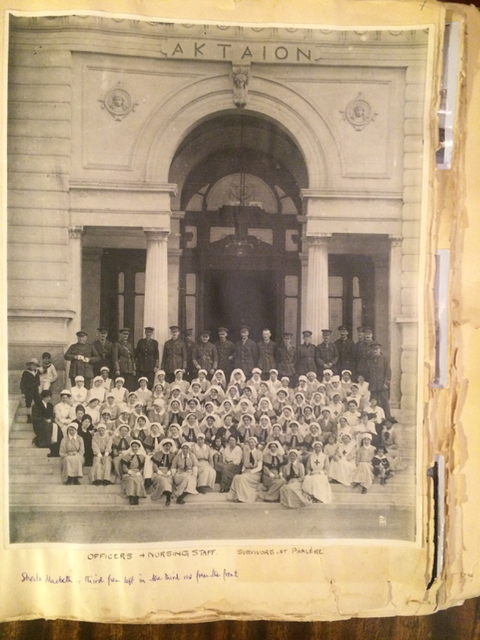 This talk will concentrate on her account of the last voyage – life on board as an Army nurse, the sinking, the rescue, and her arrival in Athens, where she was a French interpreter for Greek and Russian medical staff before returning to Britain. It will touch on her later life, as a nurse on the Western Front and her eventual retirement to Edinburgh, from where she flew out to Kea in 1976, joined Jacques Cousteau, and returned by submarine to the wreck”. Mouzaki-Hionatou Maria, from GR, creator of the Kea Folk Museum, writer of several books about Kea. Topic: “Myths, Stories and Hear-Says about the Britannic. Maria will talk in her unique way about “Myths, Stories and Hear-Says about the Britannic”. These are accounts from living relatives of Kean’s which have been handed down from grandparents-to children-to grandchildren. It is worth to mention that many grandparents either assisted shipwreck survivors or were eyewitness to the events which took part in Kea 100 years ago”. Topic: “Memories & Images from the Britannic, underwater and topside, original plans, diaries and sketches copied from the bridge of the Calypso, the characters, the crew and Kea”. Dr. Papatheodorou George, from GR, Chairman, Department of Geology, University of Patras. Dr. Papatheodorou and his Team during 2007 were performing marine geophysical sea floor investigations using side-scan sonar equipment in the Kea Channel, when accidentally hit two very important targets, which in 2008 were identified as the shipwreck of S/S Burdigala and in 2009 the intact Second Wold War era three engined Junkers 52/3m Luftwaffe airplane carrier. Aside from such world class success, he has also performed a survey focused on mapping of coralline algae, on the shipwreck of HMHS Britannic. The article linked here: Papatheodorou_etal_2008, presents the initial results of the habitat mapping and focuses mainly on the findings of the high resolution side scan sonar survey of the “forgotten” sister of the Titanic. Topic: “Modern Technologies for discovering shipwrecks, modern or ancient”. “Modern marine remote sensing technology introduces many advantages that extend the range of conventional diving work providing the means to survey in a detailed and systematic way large seafloor area. The underwater remote sensing techniques most commonly used for detecting and studying ancient and historical shipwrecks lying on the seafloor or partly buried in it, employ: (i) multi-beam echosounder, (ii) side scan sonar (acoustic imaging) and laser line scan (optical imaging), (iii) subbottom profiler, (iv) marine magnetometer and (v) undersea vehicles for ground truthing. The objectives of the presentation are twofold: (i) to present the results of remote sensing surveys that carried out at sites of ancient and historical shipwreck in Greece and in Mediterranean Sea, and (ii) to prove the applicability of remote sensing techniques in underwater archaeology showing that a combination of those can be a very effective tool”. Topic: “The unique Propulsion System of the S/S Burdigala (Ex-Kaiser Friedrich). As the Ferdinand Schichau Shipyard (Schichau Werft) at Ebbing Danzig (today Gdansk, Poland) where the Burdigala was built, was famous for their fast Naval destroyers and patrol boats. Their propulsion designs were also influential to the construction of the Burdigala and is unique in the area of Ocean Liners. Also, the Steam Engines were untypical”. Dr. Salomidi Maria, from GR, is a Research Associate at the Institute of Oceanography of the Hellenic Centre for Marine Research-HCMR. Her main research interests lie in the fields of benthic ecology, ecological quality and environmental impact assessment, habitat mapping and assessment, sensitive species and conservation, marine protected areas, sustainable diving tourism, visual census techniques, and ecology of alien/invasive species. She is a founding member and a Diving Safety Officer of the HCMR Scientific Diving Team, as well as an experienced trimix diver and underwater photographer. Topic: “The importance of shipwrecks as sources and sinks of marine biodiversity: implications for science, conservation and management. The importance of shipwrecks in attracting and protecting marine biodiversity, as an added value to science and recreational activities”. Dr. Simosi Angeliki, from GR, Director of the Ephorate of Underwater Antiquities, Hellenic Ministry of Culture. Indicatively the Ephorate is responsible for authorizing for underwater research, piscicultures, aquacultures, shell fishing, cable-laying etc, plus granting permissions for underwater photography, film making and video recording etc. Dr. Simosi has a long experience in shipwreck archeology and has been involved in many projects pertaining to the HMHS BRITANNIC & S/S BURDIGALA. Topic: “Underwater Museums in the Sea Area of Kea and Proposals for their Promotion. The aim of our speech is to announce the designation of the new historical sea areas, which include three famous contemporary shipwrecks. Nowadays, a lot of wealthy people apply at the EUA in order to have the opportunity for a dive in the Britannic shipwreck. 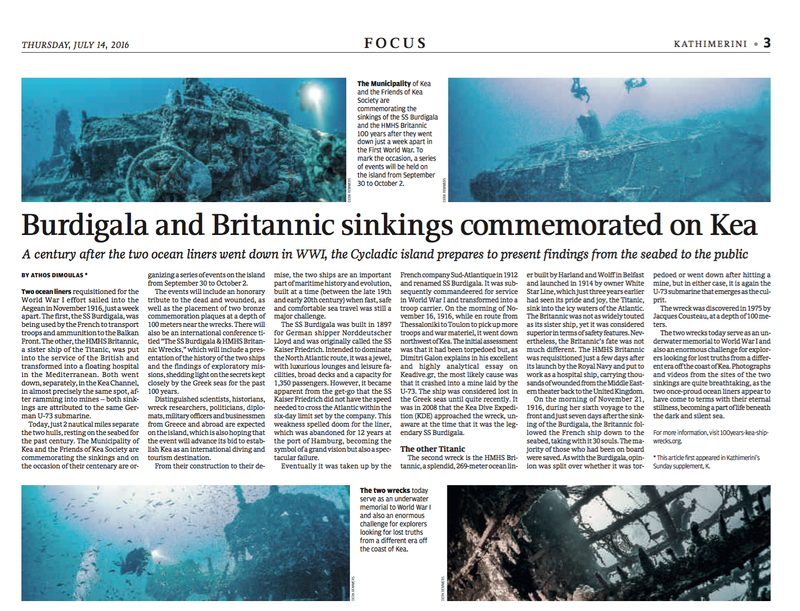 This was the reason that our Ephorate has decided to promote the three most important sunken ships in the Kea seabed, such as Britannic, Patris and Burdigala and to create an extensive underwater museum”. Tomashov Dimitry, Submersible Pilot, also Underwater Explorer from Russia. Part of the team of U-Group Malta and member of the Team of U-Boat Malta Ltd. Dimitry has impressed many seasoned explorers, BBC reporters and others, by his impeccable skills in piloting the Triton 3300/3 submarine.